The 2019 Great Muskoka Ice-Out Contest Is Now Closed! For centuries, the date that the ice goes out signals the start of cottage season. The water colour goes back to its brilliant blue, boats go in the water, birds return from migration, and Muskoka seems to come to life. We have compiled over 125 years of information on ice-out dates, from a variety of sources, to help celebrate this special time in this historic area of Canada. 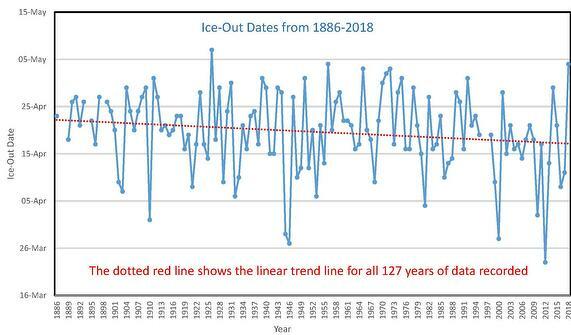 - 2018 tied with 1956 for the second latest ice-out date on record : May 4. For more information of methodology, please see the presentation link below.